Maurice Barbanell (1902-1981) was an accomplished journalist and superb medium for the Teachings of Silver Birch. The description of “life after life” in his book “They Shall Be Comforted” is well worth sharing. 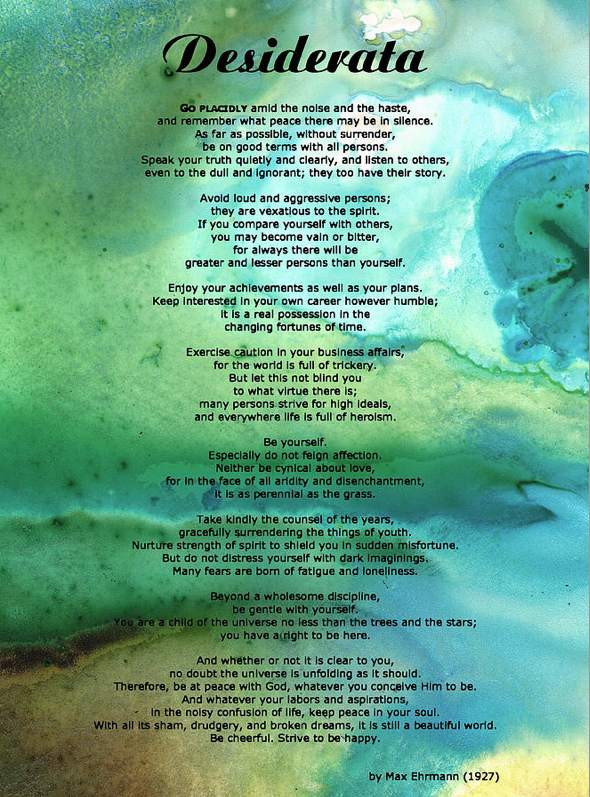 If you are currently grieving the passing of a loved one, you are urged to read this extract. One day after “death” you will be the same individual as you were one day before it, except that you will have discarded your physical body. You will express yourself through your etheric body, which is a replica of the physical one. It does not, however, reproduce any of its imperfections. All disease and infirmities will be left behind. The deaf will hear. The dumb will speak. The blind will see. The cripple will be a cripple no longer. You must try and understand that life in the spirit world is not dreamy or nebulous. It is full of activity. It is just as real as the life that each one of us lives here. We are accustomed to thinking of the material world as being real and solid, although actually, this is not so, as the science of physics proves. The things of the mind, or the spirit, seem to us shadowy and vague, but to those who live on the Other Side, the mental is the real and the physical is the shadow. The spirit world is round and about us. Some people see it and hear it because they can tune into its vibrations. It is not situated in some far-off continent. It is a part of the universe, blending and intermingling with the physical world. You must dismiss from your mind the old-fashioned theological idea that, after “death,” there is an undisturbed eternal sleep. There may be, at first, a short time of rest to enable the newly-arrived spirit to adjust himself to his new life. This usually takes a little time. Then he meets those who have preceded him. Families are reunited. Old associations are re-established. Friendships are renewed. Sometimes, people are puzzled because they learn that there are houses on the Other Side. You must remember, though, these are not houses made of bricks and mortar but constructed out of thought. This applies also to the clothing that is worn. The instinct to clothe oneself is deeply rooted and has become habitual. No one would dream of walking through the streets unclothed. This habit is part of our mental make-up. That is why it persists on the Other Side where mental states are the reality. As long as there is a desire for food, this mental desire is mentally satisfied. As long as the individual craves for food and drink, he can obtain the illusion of what he requires – and it satisfies him. You may call this material if you like, but it is far more sane and logical than pearly gates and golden harps! In the spirit world, there are no language difficulties. All people of all nations speak the same language – thought. There are no words to be mouthed, for ideas are conveyed telepathically, from one person to another. Words, after all, are but clumsy substitutions for thoughts. They are artificial means by which we communicate our ideas to one another. But words can never adequately express the thoughts one is trying to convey. Physical age and mental growth do not proceed at the same rate. We rashly judge a man’s mentality by the age of his physical body here. On the Other Side of life, it is the mind which survives, and mental growth consists of progress towards maturity. Little children will grow older. The old people grow younger in spirit. What work do they do? Each person seeks to express his natural bent. In this earthly life of ours, there are thousands of singers who have never sung; actors who have never acted; painters who have never painted; poets who have never written a line of poetry; musicians who have never composed a note of music. All these talents have never had an opportunity of being expressed, because through economic circumstances usually, the owners had to follow some other occupation to secure their bread and butter. The spirit world will not be so unfamiliar as we think because … most of us visit it in our sleep state. Unfortunately, few of us remember what transpires. When, however, we pass on, the law of association of ideas will recall our nocturnal experiences. When we pass on, we do not enter Heaven through “pearly gates”, neither do we descend to Hell through lakes of “fire and brimstone”. Nor do we sleep forever. Each one of us naturally gravitates to the spiritual sphere for which we are fitted, according to the life we have lived and the character we have evolved here. We cannot occupy a higher sphere than the spiritual status we have reached, nor will we desire to occupy a lower one. Automatically, we shall go just to that plane of spirit life for which we are fitted. We shall not be able to pretend that we are better or worse, for stripped of our physical body we shall be revealed and known for what we are. People who have lived normal lives will not find anything to disappoint them when they arrive in the spirit world. It is the selfish man who has to face great difficulties, due to these earthly habits which act as a barrier to be overcome by progress before he is fitted to associate with those he loves. If by virtue of life he has lived upon earth, he has cut himself off from those who love him, that will be his hell. What is heaven? It is the reward of a life wisely spent on earth, for it will mean that automatically we reach those we love … heaven and hell are mental states. Of course, those who dwell on a higher plane can, if they so desire, visit spirits on relatively lower spheres. This they often do. But it is impossible for those on lower planes to visit those on higher. In many cases, those who “die” go through a difficult period of stress, due to the fact they cannot reach the ones they love on earth. When they have awakened to an understanding of their new life, they naturally return to their loved ones to try to tell them of their survival. They find it hard to understand that while they can see the earthly members of their families, the bereaved are unable to sense the presence of those for whom they are mourning. This is a very poignant sorrow that thousands of spirits experience. They do all they can to attract the attention of earthly friends, but too often they fail and have to leave them disconsolate. Spiritualist also indulge in the habit of mentally communicating with those who have passed on by sending them messages, treating them as if they were actually present in the room. I know that these messages are received, for again and again I have heard spirit return thanks for this communion and give evidence that he has received it by repeating to the medium some of the ideas expressed. Spirit life is not a state of vagueness or eternal sleep, but one of activity and labour. Idleness and unemployment do not exist there. There is plenty for all to do, although I know it is difficult for us who are immersed in material affairs to appreciate the activities of the spiritual world. Apart from labour, there is the opportunity for recreation and enjoyment. There are means of education and instruction in all branches of life – in just that particular form of knowledge which the spirit desires. Of course, many of them are engaged in tasks which mean co-operation with people in this world. Some of them are hard at work helping to make communication between the two worlds easier. Others, attracted by people in our world who are following similar lines of research, industry, art or reform, naturally return to inspire those efforts, although often people in this world are unconscious of spirit interest. Happiness is the natural outcome of being aligned with Essence, our true self, which is experienced when we are fully present in the moment. The key to happiness is being very awake and aware of what is really happening in every moment rather than being absorbed in thoughts about the past, the future, your life, other people, and the many other thoughts we tend to get lost in, which don’t add to our life or enhance our experience of life but, rather, detract from the potential joy, peace, and contentment inherent in each moment. Happiness is in our control, since where we focus our attention is in our control. When we focus it on what the mind is telling us, we suffer; when we focus it on what is real and true in this moment, we experience happiness, joy, peace, and contentment. The present moment is all that exists since the past and future are simply thoughts about the past and the future. But because we are programmed to pay attention to our thoughts, we often fail to notice what is actually going on now. Most people live in a mental world. When we drop out of this mental world into the Now, we experience a depth, a richness, and a joy and peace that feel sacred. This is the experience of our true self or Essence. So, when we talk about being in the Now, we are also talking about this experience of Essence. Whatever you are doing, enjoy it! You have another option, of course, which is to not enjoy it. Notice what keeps you from enjoying whatever you are doing. It’s your thoughts, isn’t it? Even if you are experiencing pain, for instance, or something unpleasant, like going to the dentist, if you don’t listen to any negative thoughts, fears, complaints, and desires related to that, you won’t suffer. You will just have the experience. You can go through life this way if you want, but when you are not fully in contact with what you are doing, you miss out on the potential joy and pleasure in an experience. Any experience can be interesting since you have never had it before. And any experience can be enjoyed because when you immerse yourself in it, you lose the false self (the sense of I or me) and discover the true self, which is always enjoying life. Essence is always in joy. And from Essence’s standpoint, every moment is an opportunity to serve life and love, which is another source of joy. What if you approached each moment as an opportunity to experience, serve, or love? Taken from an article written by Gina Lake, with thanks. 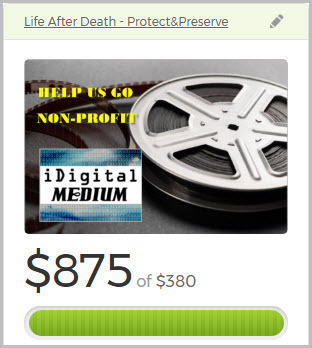 For the people who contributed so that iDigitalMedium can have the funds to incorporate as a non-profit – we say thank you. I personally guarantee that your trust in us was not misplaced, as we will show in the remainder of this year and beyond. We’re working stiffs – just like you, and we are proud to partner up with you for the greatest challenge of our age. A total of $875 was raised from all sources (online and offline). The reason the fundraiser shows a goal of $380 is because a few donors had given prior to the creation of the GoFundMe. This fundraiser was a success – thanks to YOU! Did you know the cost of just filing with the IRS alone as a non-profit is $400? And when GoFundMe takes their 8% fee we’ll likely have just enough to get started out on the right foot with the rest of the official filings. A place that will make it EASY to find information regarding life after death, a team that will SEEK this information out, as well as SAVE it for our children and our children’s children. “To live intuitively is to live in freedom. My definition of freedom is to live without fear. Most of the fear we have is created by the thoughts in our mind, we worry over decisions we have to make and the people we care for. But when you learn how to trust your intuition, you know that there are multiple ways we know what we know, and the thoughts in our head are trying to keep the physical body safe, and therefore it’s always looking for problems! But did you know you have more than one brain! Embedded in the lining of the intestines, is the enteric nervous system, with hundreds of millions of neurones one-thousandth the number in your brain. Gut neurones communicate with the brain through the vagus nerve, which runs from the base of the brain to the chest and abdomen. This ‘gut reaction’ happened to protect us from danger. Using the gut, we could sense predators before we saw them with our own eyes. The clearest connection between the gut and the mind is how we experience anxiety and stress. A gut instinct is when we have a reaction to something we may find fearful. Making decisions through this form of intuition means that we make choices out of fear or defence. There are, in fact, two forms of intuition as I write about in my book ‘You DO Know learning to act on intuition instantly’. The second form of intuitive knowing is often discounted because it has no words. It is rooted in emotion. For example, when we have an excited, expansive feeling and we simply know, we may not understand why we know, we just know. This second intuition centre comes from your heart. The heart has its own independent nervous system. Like the gut, there are at least forty thousand neurones (nerve cells) in the heart. This is as many as are found in various subcortical centres of the brain. Following this heart lead intuition can lead to remarkable life changes, as your decisions become about the expansion of who you are rather than limiting yourself to avoiding pain or fearful situations. On a personal level of using heart-based intuition means you can make quicker decisions about what is right for you, which also means less stress. It also means that you can open your heart more widely to people as you know who you can trust, making it the intuition to follow for love. Next time you hear ‘follow your gut’ you will understand it’s not a brainless act after all. Becky Walsh is one of the world’s leading authorities on self-belief and intuition. She has hosted her own award winning radio show on LBC 97.3 UK and presents on Hay House radio. Becky is often delivering comment and analysis in the media worldwide and is a blogger for the Huffington Post and Psychologies magazine. Becky is an excellent speaker and has given an address at ‘I Can Do It’ Seminar London. Her private practice for breakthrough’s by phone or in person in Bristol and London. Becky is a Hay House author of ‘You DO Know – Learning to act on intuition instantly’ as well as four more published books. Becky has an online course ‘Get clear on you book idea’ for budding world changes. Becky’s teaching also effortlessly blends her unique humour with ground-breaking, smack-on-the-forehead insights that put YOU in the driving seat of your life. Note: Becky’s article was printed as she wrote it. However, the article had several significant errors of spelling/punctuation, and they were corrected. I shall feature another organisation dedicated to this connection in another post. With thanks to Sharon Cummings for adding her exquisite artwork to words that are timeless. We understand that we want to be better but have no clear definition of what better means and that is part of the process. At some point in our lives, many of us find ourselves overcome with the desire to become better people. While we are all uniquely capable of navigating this world, we may nonetheless feel driven to grow, expand, and change. This innate need for personal expansion can lead us down many paths as we develop within the context of our individual lives. Yet the initial steps that can put us on the road to evolution are not always clear. We understand that we want to be better but have no clear definition of “better.” To ease this often frustrating uncertainty, we can take small steps, keeping our own concept of growth in mind rather than allowing others to direct the course of our journey. And we should accept that change won’t happen overnight–we may not recognize the transformations taking place within us at first. Becoming a better person in your own eyes is a whole-life project, and thus you should focus your step-by-step efforts on multiple areas of your existence. Since you likely know innately which qualities you consider good, growing as an individual is simply a matter of making an effort to do good whenever possible. Respect should be a key element of your efforts. When you acknowledge that all people are deserving of compassion, consideration, and dignity, you are naturally more apt to treat them in the manner you yourself wish to be treated. You will intuitively become a more active listener, universally helpful, and truthful. Going the extra mile in all you do can also facilitate evolution. Approaching your everyday duties with an upbeat attitude and positive expectations can help you make the world a brighter, more cheerful place. Finally, coming to terms with your values and then abiding by them will enable you to introduce a new degree of integrity and dignity into your life.